My glove/gauntlet has a loose wrist, why is that? Do I have to wear a gauntlet/glove with my compression sleeve? What compression class do I need? What is Class 1 (20-30 mmHg) and Class 2 (30-40 mmHg) and how is compression defined? Can I request a custom made sleeve? When should I wear my sleeve? 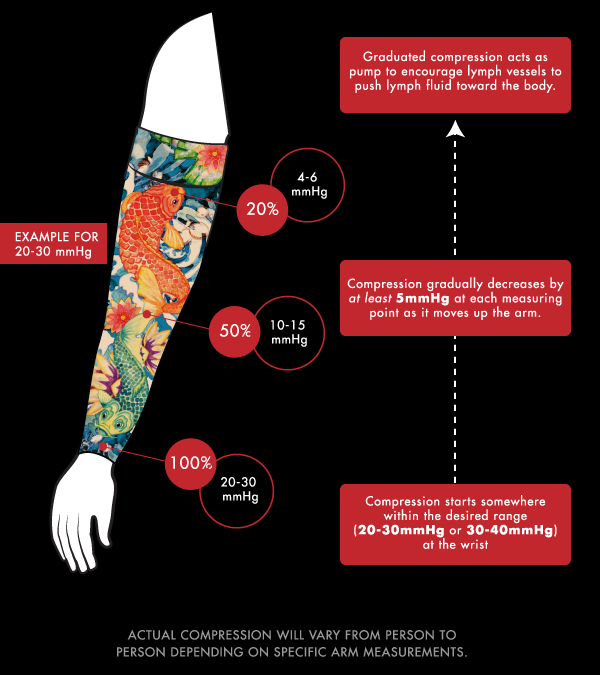 Is it okay to wear a compression sleeve on my unaffected arm or if I do not have lymphedema? I hate when people ask, "What happened to your arm?" Any suggestions on how to respond? How can I trust that LympheDUDEs garments will safely manage my lymphedema? Do you offer different sleeve lengths? I am a female with lymphedema; can I wear your products? My sleeve rolls down, what can I do? Are LympheDUDEs products covered by my health insurance? I have lower extremity lymphedema. Do you have any options for me? I have truncal lymphedema. Do you have any options for me? I have lots of ideas on how to improve my sleeve. How do I share my ideas and suggestions? I need compression in my fingers. Do you have options for me? Having double pressure in the wrist from the glove or gauntlet and the arm sleeve can result from improper graduation in the compression and increased swelling. That’s why the glove and gauntlet were especially designed to have no overlapping compression at the wrist when worn with a sleeve. It is the belief of our medical board that it is best for lymphedema patients to protect their hand with a compression gauntlet or glove to be worn along with their compression sleeve. If a sleeve is worn without a gauntlet or glove then the pressure from the sleeve can push lymphatic fluid into the hand instead of up toward your body. When you wear a sleeve and a glove or gauntlet together you can protect yourself against the risk of this happening. It is best to consult your doctor or lymphedema therapist about which level of compression is best to manage your swelling. A doctor or therapist will assess your arm for swelling and develop a plan with you to manage and/or reduce your lymphedema. Each plan is individually tailored for each patient, self-management lymphedema care often includes wrapping, manual lymph drainage massage and wearing a properly fitted compression garment. As a basic rule of thumb, Class 1 (20-30 mmHg) is generally for preventative wear for those at risk for swelling and for minor swelling and Class 2 (30-40 mmHg) is for more severe edema. Class 1 compression provides 20 to 30 millimeters of mercury (mmHg) pressure at the wrist (and/or fingers and palm, depending on whether you wear a gauntlet or glove), the compression will reduce as the garment goes up your arm toward the body. Ideally a 20-30mmHg sleeve will have 20-30 mmHg pressure at the wrist (or fingers/palm), then a gradual reduction in pressure of at least 5 mmHg per measuring point. The reduction in pressure will help push the lymphatic fluid up to circulate toward your body. Class 2 compression provides 30 to 40 millimeters of mercury (mmHg) pressure at the wrist (and/or finger and palm, depending on whether you wear a gauntlet or glove), the compression will reduce as the garment goes up your arm toward the body. Ideally a 30-40 mmHg sleeve will have 30-40 mmHg pressure at the wrist (or fingers/palm),then a gradual reduction in pressure of at least 5 mmHg per measuring point. The reduction in pressure will help push the lymphatic fluid up to circulate toward your body. If you’re curious what compression you’ll be getting in our sleeve and gauntlet/glove, try our iOS Fitter’s Aid app. Our Fitter’s Aid app is able to provide the compression curve for any set of arm measurement and compression class combination. As a basic rule of thumb, Class 1 (20-30 mmHg) is generally for preventative wear for those at risk for swelling and for minor swelling and Class 2 (30-40 mmHg) is for more severe edema. Your doctor and/or therapist will recommend a garment you will actually wear and that will benefit you more as a part of your self-care and management plan. Please consult your doctor and/or therapist when deciding which compression class you need to manage your existing swelling or lymphedema risk. If you’re interested in a custom sleeve design, we would love to work with you to create the compression sleeve of your dreams. Please send an email to contact us with your request. Unfortunately we do not offer custom made compression garments at this time. The amount of time and degree to which you wear your compression sleeve will depend on the severity of your lymphedema and the self-care program you’ve developed with your doctor and/or lymphedema therapist. If you do not have a self-care regimen developed, it is best to consult with your doctor or therapist to determine when and how often you need to wear your sleeve. We do not recommend that our garments are worn overnight. Yes! Our sleeves are wonderful for enhanced athletic performance and if properly fitted can be worn on any arm, affected by lymphedema or not. By wearing LympheDUDEs products as a performance enhancer, you help prove that the sleeve is more than just a medical device. Have more stories, statements, or comebacks you would like to share, please contact us! LympheDUDEs products are completely medically correct. Our garments are registered with and approved by the FDA. The graduated compression is tested multiple times using the best state-of-the-art equipment available. As long as your sleeve is accurately fitted, LympheDUDEs garments are made to manage your lymphedema without sacrificing style or comfort. The best way to determine your size is to consult with your doctor or therapist to work with you to find a garment size and compression combination that will best manage your edema. You can find a certified lymphedema therapist through the Lymphology Association of North America (LANA). You can get fitted by a certified fitter, you can search for a store location that sells our products through our store locator. Be sure to call ahead to see if the store has a fitter on staff and to schedule an appointment with them. If you do not have access to a doctor, therapist or certified fitter, you can use our sizing chart and fitting instructions to assist you in determining your size. If you’re an iOS user, download our Fitter’s Aid app and enter your measurements and compression class to receive a sizing recommendation. A properly fitting sleeve is essential in a self-care management regimen! If you have any questions, don’t hesitate to email us or call us with your measurements for a sizing recommendation. It is especially important to speak to your doctor, therapist, certified fitter or us if you’re in between sizes. If you do not fit into our sleeves, send us an email, we’re constantly developing our product offerings and hope to expand to add more sizes in the future! Our sleeves come in a Short and a Long length. Please don’t be put off by the length names, we don’t have a “Regular” length anymore because we don’t believe that there is a standard arm length, just like there isn’t a standard arm size, by only offering a Short or Long option we hope it will inspire our customers to measure their arm and get the sleeve that will fit them the best. To determine length, measure your arm length from wrist to the top of the bicep; the Short sleeve length accommodates arms 37-44 cm and the Long sleeve length accommodates arms 43-56cm. Please refer to our sizing chart for more information. The length formally known at Regular is now called Long. I am a male with lymphedema; can I wear your products? Yes! You can find our LympheDIVAs line here. All LympheDUDEs sleeves come with a gripper band option called the Diamond Band Gripper. The Diamond Band Gripper offers a hypoallergenic, latex-free and silicone-free gripper, which is applied directly on the inside top cuff of the sleeve. The Diamond Band Gripper will keep your sleeve in place without irritating the skin. It is best to call your health insurance provider and ask them whether they cover medical, graduated compression garments for the treatment and/or management of lymphedema. You can find a LympheDUDEs vendor that processes insurance using our store locator, not all stores process insurance, it is best to contact the store directly to check. If you order through us directly, please note that we do not process insurance but we do provide insurance codes on our invoices that can be used for reimbursement through your insurance company. Please note that, at this time Medicare and Medicaid do not cover any compression garments. Have no fear, Lower Extremity Lymphies!! We know you are out there and we look forward to serving you. What we like to say is that we are “working our way down the body.” We began with what we know (upper extremity) and look forward to expanding what we have learned regarding lymphedema to lower extremity in the future. We are constantly developing new products and ways to better serve our wonderful customers, we look forward to expanding our compression offerings in the future. We are constantly coming up with new ideas and we’d love to hear your thoughts and feedback. Contact us and let us know what you’re thinking about. So glad you asked! We now offer a beautiful, comfortable, seamless and lightweight glove option! Click on any of our products to view the glove. Yes, call us at the office between 9am and 5pm EST Monday through Friday. Toll-free at 866-411-3482 or 413-344-4517. Yes, you can order directly through our website! If you have any questions about ordering please don't hesitate to contact us. We also have a number of international distributors, please check our store locator to see if there is one in your country or region. Yes! You can request one here. All in stock orders are shipped within 1-2 business days. You will receive an email with your tracking number once your order ships. Our standard shipping within the United States is USPS First Class or USPS Priority depending on package weight, packages over 13 oz are automatically upgraded to Priority shipping by USPS. International standard shipping orders are sent through USPS Priority International, then delivered within each country by the local post office. Delivery time is 6 to 10 business days, excluding time spent in customs. We do not collect VAT, duties or taxes and cannot predict what your particular charges may be. For more information regarding your country’s custom policies please contact your local customs office. We do offer UPS expedited shipping. Check the appropriate shipping option at checkout or give us a call with your expedited shipping order. Yes, please review our refund & exchange policy and contact us for a Return Merchandise Authorization (RMA). You are responsible for return or exchange shipping postage to us, but we will mail out the exchange to you at our cost. Due to the high cost of shipping abroad, international customers are responsible for the shipping costs on exchanges. Contact us! Call us at 866-411-3482 (9a-5pm EST M-F) or contact us here.